Everyone has their own way of celebrating spring holiday traditions such as Easter and Passover, but when it comes to holiday gatherings, we can all agree that delicious food is a must! Here are some helpful tips and serving ideas for easy Easter Sunday celebrations. Make an irresistible omelet by adding Sun-Ripened Dried Tomatoes, Kalamata Olives, fresh herbs and a dollop of tangy goat cheese or crumbled feta. Use Jalapeño Stuffed Olives & Peperoncini or Spicy Italian Olive Antipasto to spice up your favorite Bloody Mary. Roughly chop Spicy Italian Olive Antipasto and toss into an omelet. Mix the marinade with a bit of extra virgin olive oil and use it to dress a side salad topped with the peperoncini and you’ve got a beautiful brunch. 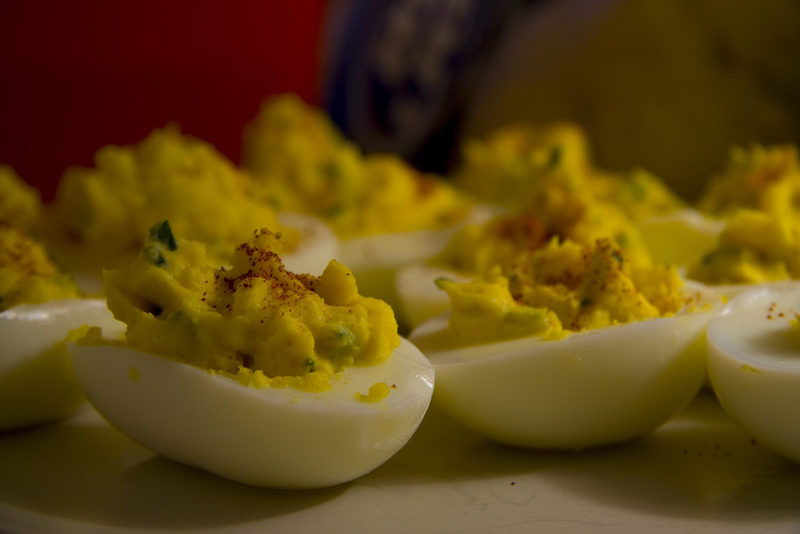 Make “egg-cellent” deviled eggs with our Diced Jalapeño Peppers or top them with or slices of our Jalapeño Stuffed Olives. Cube your favorite cheese and combine with a variety of olives, olive oil and a few shavings of citrus peel. Serve Spicy Italian Olive Antipasto with feta cheese, hummus and warm pita triangles. Create an antipasto platter using Garlic Stuffed Olives, Whole Golden Greek Peperoncini, Roasted Red Bell Peppers, and assorted meats and cheeses. Serve Castelvetrano Olives as a quick and addictive snack by themselves or alongside Spanish Marcona almonds and Manchego cheese. Garnish roasted potatoes with Roasted Bell Pepper Strips or toss them with our Roasted Bell Peppers & Caramelized Onions. Toss Spicy Italian Olive Antipasto, along with its marinade, with romaine lettuce and tomato wedges. Drizzle with extra virgin olive oil and top with crumbled feta cheese for a super quick and delicious side salad. Pit Castelvetrano Olives and add to braised meat dishes. Toss pitted Castelvetrano Olives with mixed baby greens, orange sections, shaved fennel and a light lemon vinaigrette for a beautiful and refreshing side salad. Combine our Castelvetrano Olives along with red onion, edamame, fresh peas, broccolini (or any fresh vegetables you have on-hand) with lemon zest, tarragon and EVOO for a hearty Easter Dinner side dish. Click here for the full recipe. Add Organic Pitted Whole Greek Kalamata Olives, Roasted Bell Pepper Strips and Sun Ripened Dried Tomatoes to couscous to make a bright side dish to accompany the main dish.